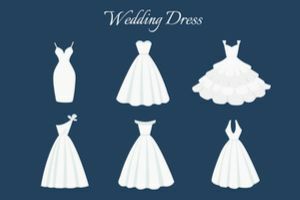 Wondering what your wedding dress will look like? It's a good question! Your wedding dress should reflect you, right? Let's find out what that means for you. Maybe your dress will be backless. Or sleeveless. Or feature a really long, dramatic train that leaves everyone with a dropped jaw. Let's find out for sure. It's time to figure this all out. Answer 29 easy questions about yourself and we'll tell you what that means for your wedding dress. Are you ready to find out?